woodland trails in the midsummer. season's end, here on the south shore. 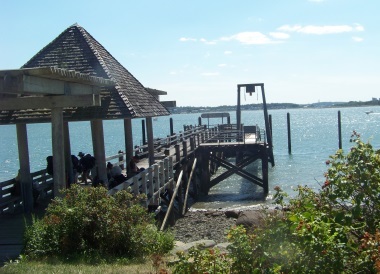 A trip to this breezy, lightly shaded island of the Boston Harbor Islands National Park is pleasant, scenic and cultural! Bumpkin Island is part of the town of Hull. It has an interesting history all of it's own! 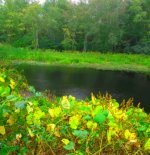 Like most of New England, the early Native Americans used the island. It is easily seen from the shores of Hull, so naturally it was explored and found useful for fishing. In the nineteen century the European settlers used it for a fish drying operation. It also was used by tenet farmers in that era as well. 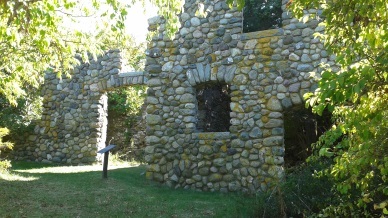 Side view of stone farm house remains. 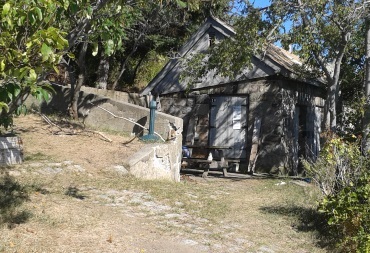 The stone house remains on the island are determined to be what is left of the farmhouse and barn used by those farmers. In the early twentieth century the fish drying turned to fish smelting. Smelts, also known by the name of Osmeridae, are small fish that are found in the Atlantic and Pacific Oceans as well as in freshwater areas throughout the Northern Hemisphere. They look quite similar to very tiny salmon, with few of them reaching more than eight inches in length. They generally tend to live out most of their lives in salt water, but like many other fish, come back to fresh water to spawn. Prized for more than just their meat, smelt also produce a bright orange roe that is frequently found atop sushi. 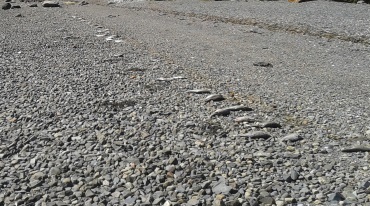 Dead smelt line the shore from an incident in Hingham harbor. In current times smelt are used as bait for larger fish. 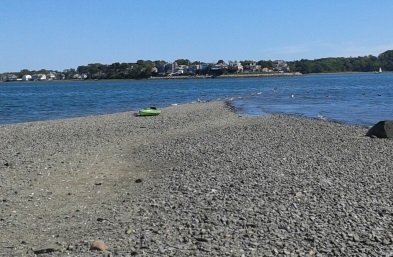 In the picture above the smelt lined the shore on the island as a result of an incident where apparently a commercial fisherman lost their bait and filled Hingham harbor with the dead fish. Glad that is a rare occasion! With the Weir River opening just on the other side of Sunset Point, this makes this little island a perfect place for smelting. 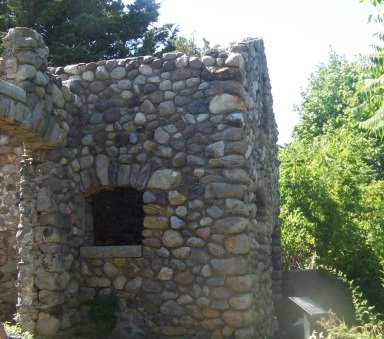 Another well known feature on Bumpkin Island from the early twentieth century, is the hospital that was built for physically handicapped children. The builder, Albert Burrage is also known for another recreational area on the south shore. What is now known as Camp Kiwanee and owned by the town of Hanson was Mr. Burrage's summer home known then as The Needles. The hospital, being part of his philanthropic interests is said to have been one of the first buildings that used ramps for wheelchairs. Once WWI arrived the US Navy took over the island for use in training. Mr. Burrage continued his public service by loaning his 260 foot steam powered yacht, the Aztec to the Navy. Once the war was over, operations on Bumpkin were dismantled. The hospital reopened in 1940 taking polio patients but closed once again during WWII. Then burned in 1945. 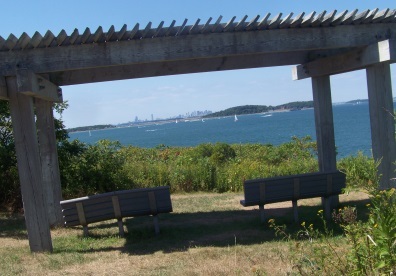 Since 1996 it has been part of the Boston Harbor Island National Recreational Area. 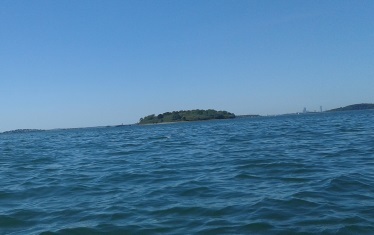 From a distance you can see the oval shape of the drumlin that makes up Bumpkin Island. 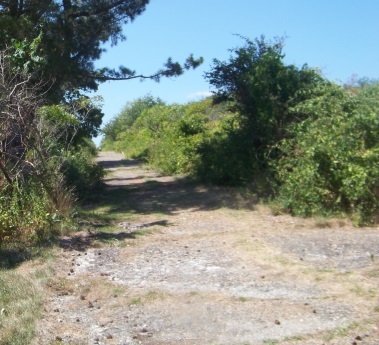 Bumpkin island has an area of 30 acres, plus an intertidal zone of an additional 31 acres. It is composed of a central drumlin with an elevation of 70 feet above sea level. This makes way for some moderate exercise on a couple of the island trails. It is surrounded by a rock-strewn shoreline, not generally found agreeable for swimming but the option isn't completely off the table! 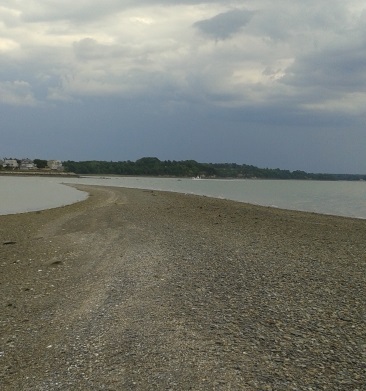 A sand spit, more like rocky extended beach, exposed at low tide, connects the eastern end of the island to Sunset Point in Hull. Something I didn't notice til I was well out in the choppy hard to navigate water, the day I visited! At least I got a good upper body workout, just a bit too good though! When the tide is low enough it is possible to just walk out to the island! There are two common kayak launches in Hull. Sunset Bay Marina being the closest to Bumpkin Island, and the other located at the end of the peninsula of Hull, Pemberton Point. Hull is a busy place in the summer, both seemed tough for parking. 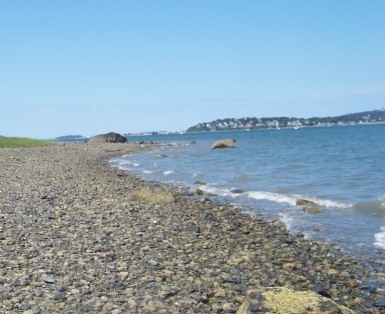 Of the several times I visited Bumpkin island, twice I chose a spot along Newport Rd. Considered a beach, though a bit rocky in the sense of a typical beach, there is a large area to park and seldom used (the best feature here)! The disadvantage to this launch site is not having a formal boat launch area, the launch was a bit more difficult. You need to carry your kayak down some stairs to the beach, though not difficult, a bit cumbersome. Once in the water, this side not being on the ocean side has sand that is more like mud. Water shoes are better here but they did sink down into the mud. Another advantage to this site, it is an even closer launch than Sunset Bay. The island is directly in front of you. The paddle to Bumpkin Island should only take 1/2 - 3/4 hour. 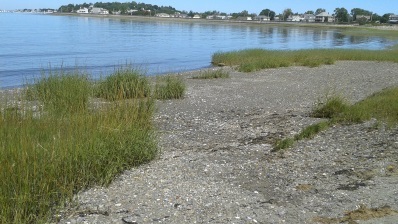 The water along the way if at any point near low tide will be fairly shallow for most of the paddle. Another spot used is on Nantasket Rd., not far from the Newport Rd. location. Just after the walkway that connects the two areas is a little used park area. Room for a couple cars alongside the road. This was a bit more beach like and was actually a shorter paddle. Found this area and paddle to be great for first time harbor users! at a rocky beach that is perfect landing spot. Caution here: Knowing the tides is important. pull your watercraft up high on the beach. away in the harbor once the tide rises! dirt road that will start the hiking part of the journey. 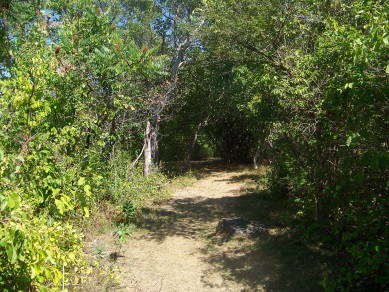 Much of the hiking trails on Bumpkin Island are wide sandy roadways or cart sized hiking trails. you will find a trail leading to the right. and back to this dirt road as an ending point. You will almost immediately start a gentle short climb. is not much taller than the average person. anyway from the island walking trails. Some areas get grassy and meadow like with more tree coverage. Even turkeys can be found on this island! Just under 1/4 you will come to one of the older trees. Looks like it could've been an apple tree, now too old to hold fruit. Soon after the trail takes a bit of a left and again climbs. form an umbrella like shape. 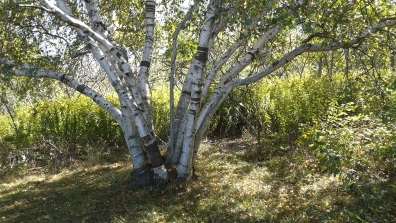 Afterward at 1/4 mile you will come to a large birch. Here the trail goes left and climbs again. Another trail leads to the right down onto the beach below. At .28 the first signs of remnant foundations. 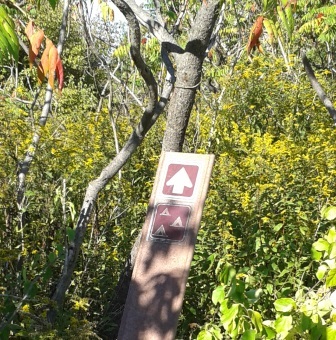 The hiking trail will make another short moderate climb and come to another intersection. If followed left, it will take you through a field of ragweed in late summer/ early fall. It will also connect with the main dirt road that crosses the island first started on. To continue the hike around the island, continue slightly right on this intersection. At .30 we come upon the remains of the stone farmhouse. The trail then runs downhill, with more spectacular views of Hull. 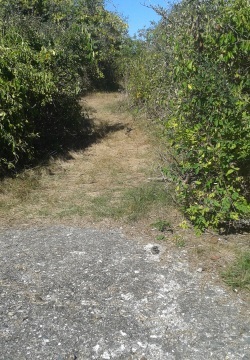 The trail leads toward the water and takes a sharp left. It then runs by what may have been part of the military facility. 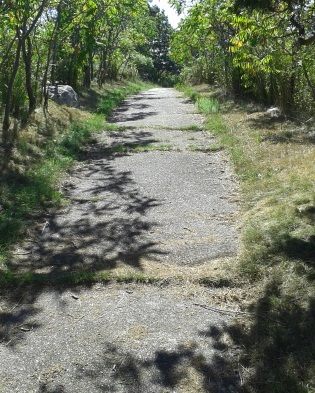 The trail now becomes an asphalt walkway here. it reaches the far end of the island, the hiking trail makes a turn but before doing so comes to a pavilion with benches and an outstanding view of the city. This particular weekend was one of the last of the summer season and the harbor was filled with every sort of boat imaginable! 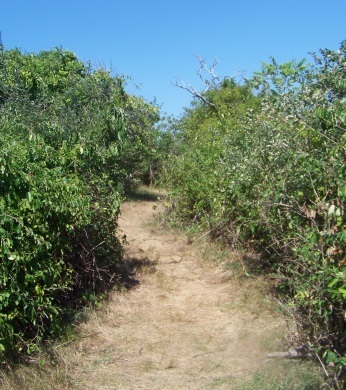 Once again the hiking trail runs through low vegetation as it starts to make it's way across and then down the other side of Bumpkin Island. At .45 you will come upon a bench and the trail will intersect the other end of the main road. 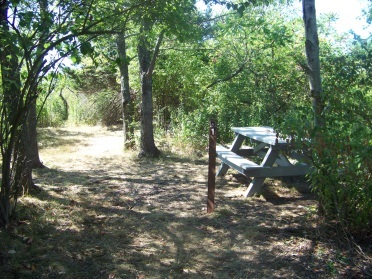 Across from this bench is a large clearing picnic area. There are several tables and grills. 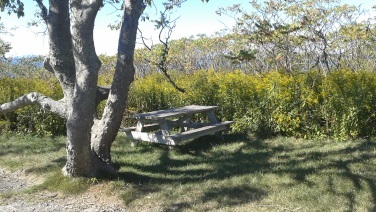 This picnic spot is along the main road hiking trail on this end of the island. If you take the right up the main road, on the left uphill, you will find the remains of the Children's Hospital. Sad, all it is now are heaps of bricks along with the famed yellow bricks it was known for. The group campsite is just a bit further across the road. This side explore add about 1/3 mile. Back down the road to the intersection with the bench, the hike around the island continues straight. It comes down close to the water and curves left. The asphalt starts to break up more here. Coming close to the water you may here a buoy clanging. You will soon be on the opposite side of the island. Once you make the turn to the other side, you will come upon another bench this one trail side. Just after the bench there will be some stairs leading uphill. This reconnects you to the picnic area. There is a fairly long straight stretch here that opens up to a clearing where you will find yourself at the pier. 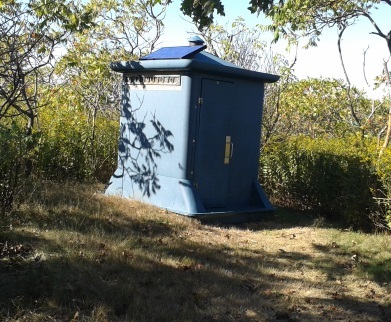 This is where the water taxi drops off visitors who wish to visit Bumpkin Island that way. Many of the visitors are those camping on the island. The pier is nice to walk out and take more views in. In the off season small boats can dock here. 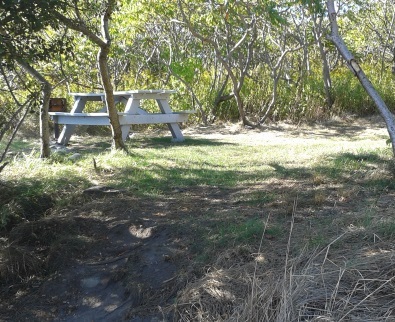 There is another bench trail side, on the pier and a ladder down to the beach below. At the far end is a ramp that takes you down to a platform at the water level. This is where you can find the ranger during the summer, conveniently located near the boat pier. 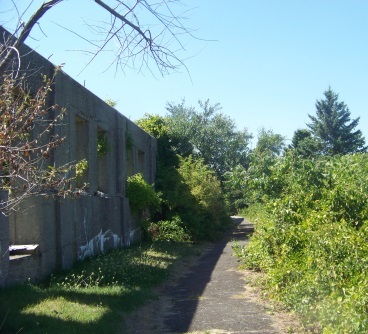 To the side of the pier, the building where the ranger station is located along the trail. If you camp on the island there is a bit of a first aid station here. There is a bit of a deck to the back of this building offering more views. The trail now climbs uphill gently, leading behind the ranger station building . 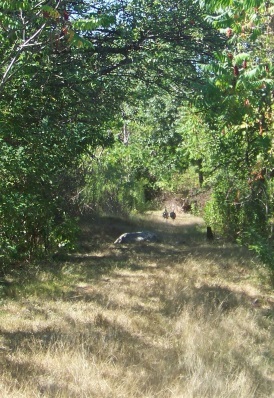 The trail turns to the left and begins a moderate uphill climb. This one is surprising for such a small island. Long enough to wind most, and make you know you are working those leg muscles! Along the way is a sign about how the islands were formed. 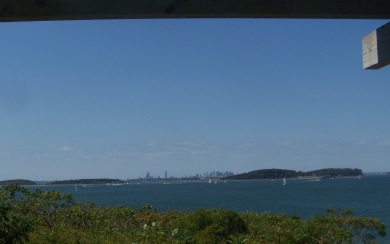 If you stop to read the sign, turn around, some good views of Hingham Harbor here! At this elevation of course more beautiful views of the surrounding shoreline. Soon we meet the dirt road once again and notice that it is partially asphalt too. You will soon come to another Bumpkin Island feature. The are equipped with solar panels. The equipment below composts (probably incinerate, though it does not say exactly how the composting is done). Marker leading you to the first 10 camp sites. The camping spots are off this road along the hiking trail route. 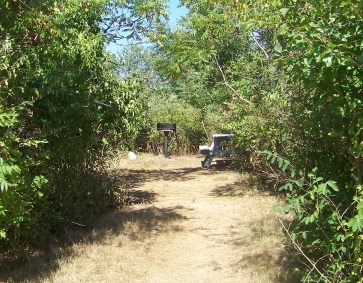 The campground path takes a left and runs by the first 10 campsites. area with the low vegetation. 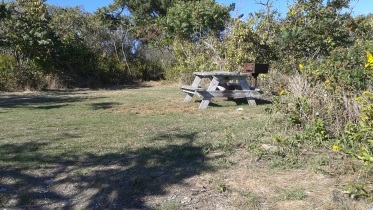 table and a couple have a barbecue grill. This one has both a table and a grill. The area for a tent is a bit out of sight. Then the path leads out once more on the main road. Take a left here. There are 3 camping spots down long paths along the left. These run close to the shore. They are pretty much right on the beach. 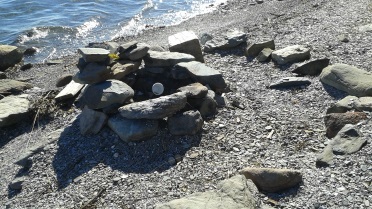 The circle of stones form a convenient seating area. beach side campfire close to the camp site. Number twelve is a step up from the beach. 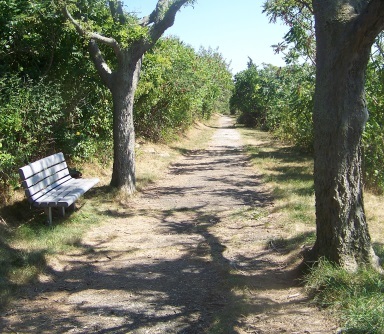 The trail around Bumpkin Island is just under one mile, but with all the extra exploration can surely come in near 1 1/2 miles! The kayak back to the car is the perfect end to a summer adventure, though the less crowded fall can be quite nice as well! Following route 228 into Hull and then on Nantasket Ave. Follow Nantasket Ave out on to the beach area and through 2 sets of lights. The road will become a one way on Hull Shore Dr. for a short way and then become Nantasket Ave once again. Follow til Nantasket Rd on the left. 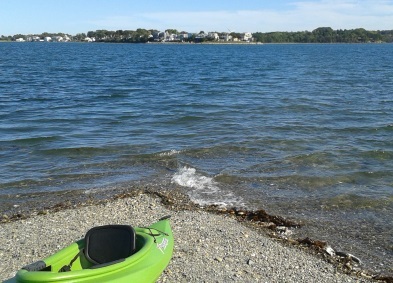 Follow Nantasket Rd for the small beach area and closest paddle. Take a right on Newport Rd if parking is an issue. Roadside parking along Nantasket Rd at the small park. Numerous parking on Newport Rd. Paddle from Nantasket Rd 20 - 35 min. From Newport Rd. 30 -45 min. Dependent on ability of paddler and water conditions. Bring plenty of water with you!